by Catherine Collings M.S.C.S.M, CEO Ultimate Edges of Excellence L.L.C. The “Ultimate” goal in Figure Skating is to score the highest amount of points. In order to do this, it has been established that one must skate beautifully! However; landing quad after quad or triple after triple isn’t enough. The only thing better than landing one beautiful jump is landing two beautiful jumps and the only thing better than landing two beautiful jumps is landing two beautiful difficult jumps in a row (combination). Super cool tricks! Right? Any figure skating program that only contains the cool “tricks” with no connecting or in between steps, moves or “FLUFF” is extremely lifeless and spiritless when compared to a “Program” that harmonizes the musical element with the physical element and the skaters’ interpretation and presentation of the music. Not only does the general audience (both informed and uninformed) take more pleasure in the performance, but the judges will also, hence giving a score with higher marks. This is where choreography, the razzle dazzle or the sparkle comes in! This is where the Program Components come into play, which can bump up the Technical Score by adding GOE’s (grade of execution). Choreography takes many hours of preparation and many hours to complete. With this said, please remember, choreography is also a NEVER ENDING PROCESS and is forever developing as the skater develops. It is an ongoing piece of art. Not only must one know the required elements or rules, one must also be creative and have an open mind when imagining an appropriate and dazzlingly beautiful program. 1. Music: As I stated in a previous article, “5 Easy Steps to Choose Music for Sport” (published by Ultimate Edges of Excellence L.L.C. and Ice Skating World), the first and most important part of a successful season, in my opinion, is selecting the music. It needs to be AGE AND ABILITY APPROPRIATE. The perfect piece of music should reflect the skaters personality and should make the athlete want to dance or move to the music. It should “speak” to the person who is going to perform to it. Instrumental music still is a traditional and widely accepted choice for programs; however, many skaters are taking advantage of the rule change this season and are using vocal music. Many coaches / choreographers still prefer to “cut” their own music, however; there are several music editing services worldwide, some have pre-mixed programs that you can pay and download on-line, however, there is no guarantee that you will be the only one with that exact cut of music. It is always wise to choose a music studio or consultant (such as Ultimate Edges of Excellence L.L.C.) that will research and work with the team and personalize the music for a reasonable cost. This personal service is extremely time consuming and editing or cutting a particular piece of music can take one hour or it can take up to 20 hours or MORE! It is always wise to include the Head Coach and Choreographer when consulting with a music consultant, editor, and/or service, so everyone can develop the same vision right from the start. 2. Choreography: This new choreographic adventure needs to develop and emphasize the athletes’ ability to reach out to the audience without compromising the highest technical scores that determine the base value of jumps, spins and step sequences (footwork). It is very tempting to add all the difficult tricks, however; if the elements cannot be performed consistently with style, flow, confidence and, of course FLARE, they should not be included in the program. Keep in mind, that the choreography for young skaters or beginner level skaters is much different than the more accomplished skaters. Most “Early” programs are very similar to “Short” programs for the more accomplished skater and have required elements that must be in the program. Therefore, make sure that the athlete is ready for that next level before “pushing” them up. All programs are created from the feet up, this is particularly important when choreographing the “early” programs which should be quite basic. These young athletes need to be developing a solid background in skating technique and need to keep working on mastering edges and edge control as well as jumps and spins. Always let the feet dictate what the rest of the body does. So, personally, I choreograph from the ground up, lay the foundation so to speak and build from there. Much like an artist creates a painting or a builder builds a house. • Create curvatures in the overall design. The judges usually sit at the short axis of the rink (red line area), therefore; do not have the program going from one end to the other and back. Otherwise, the judges may feel they are at a tennis match, and could result in a neck injury to the judging panel! • Create several changes of direction within the program. A program that is blocked to go around the perimeter of the ice surface over and over again in the same direction has, what I call, the “Nascar” effect. • Placing some of the tricks or highlights (jumps & spins) near or in the mid-section of the ice surface instead of the four corners helps to create the illusion that the program is not in fact a tennis match. Placement of highlights is crucial as you also want to make sure that the jumps and spins are spread out and not all bunched into the same spot. Once you have created the foundation of the master piece, it takes another 4 – 5 days to add the layers of artistry, fine tune, tweak, perfect. During this part of the process, it is vital when choreographing an “Early” program to allow the feet to dictate what the upper body will do. A more accomplished skater can get away with a couple of week long sessions, however, the younger skaters will, of course, need on- going tweaking of the program. I suggest a visit with the choreographer at least an hour once or twice a month or 30 minutes once a week. This can be spread out, of course, depending on the choreographers’ availability. IN BETWEEN THE CHOREOGRAPHIC VISITS, THE SKATER NEEDS TO PRACTICE, PRACTICE, AND PRACTICE! 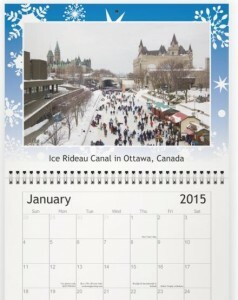 Order this beautiful calendar today, discounted!! !